Splash. It hits the water, the seriousness of life. Without a life vest, it drowns beneath the surface as I ride all the way to the beach on a wave of smiles. While all that seriousness did its best to take charge, I simply grinned to myself as I safely washed ashore. Admittedly, an idealised image, but this picture always came to mind whenever I’d trip over my legs, because of the MS, or just the other day when I stopped in front of a carpet with a somewhat psychedelic pattern and wondered if I could safely make my way across. 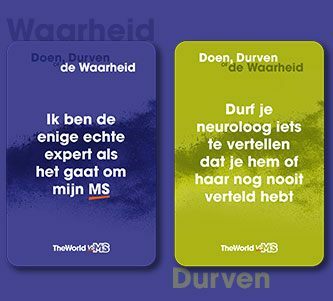 Those things happen with MS. That and having to ask the person in the supermarket for some ‘stuff’, because you can’t think of the word for bread. Living with MS, things happen that can embarrass and shame you. Because you operate differently now and then, beyond what’s considered ‘normal’. I took everything so seriously when I first received my diagnosis, and saw myself solely as a patient, no longer a human being. Everything weighed very heavily on me. Whether tired, tripping or mumbling, I was almost always ashamed, until one day someone told me very matter-of-fact that I shouldn’t take myself so seriously. It was a slap in the face, but it helped. Illness leads to seriousness, drama and misery. People become patients, with embarrassment never far away. You have to realign yourself, and that’s a process that takes time. At some point, however, you have to ask yourself whether you’re going to completely submit to the seriousness of the situation or whether a bit of laughter is actually ok. It is, by the way. We are in fact allowed to smile and have a bit of fun now and then. 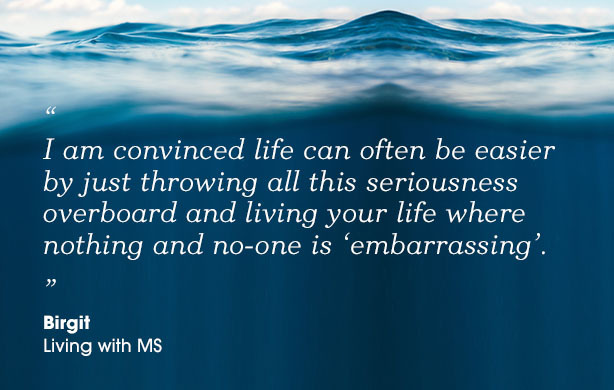 I, for one, am convinced life can often be easier by just throwing all this seriousness overboard and living your life without a life vest, where nothing and no-one is ‘embarrassing’. Much less someone just trying to get on with their life with a chronic illness. A few years ago, I started to look upon certain situations with humour. Not to try to smile away the frustration for the benefit of others, or pretend that everything is ok when it really isn’t, you understand, but I just asked myself – how serious really is this? Wouldn’t it be better to try to see the funny side in this situation? Honestly, it’s often quite fun to take a step back and see yourself from the outside, like a comic book character. And it’s not just beneficial as a one-off exercise, but one that can really help make your life easier. I began to see certain situations as less dramatic and for what they really were: MS stumbling blocks. The more self-evidently I dealt with things, the less notice I took of the little things. All that seriousness sank below the waterline. The less drama involved, the less attention I had to pay. No silly platitudes, no hysterics, life just went on. I learned to laugh at myself. Admittedly, I still give into the drama queen once in a while, along with some seriousness, but in a more comedic sense. If I stumble, it is what it is. If someone comes up to me particularly outraged because I’m drunk or something like that, I ask them, “do you have MS?”. A smile can relax you, calm you and is infectious to those around you. And what could be better than that? If this article has inspired you to open up about your MS journey and the experiences you’ve had to date, please be sure to share with us via social media using #TWvsMS.